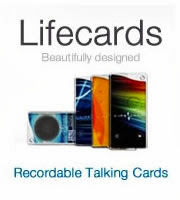 John Boucard invented Clickables technology and developed a series of products around the technology. 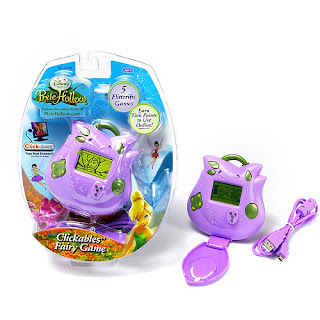 Clickables was the world’s first interactive toy that connected what you were doing in the real world with online games (the first being a massively multiplayer online called Pixie Hollow). The technology was invented by John Boucard and developed in conjunction with the Walt Disney Company. Clickables ™ Fairy Collections were magical toy jewelry collections that connect seamlessly with the new Disney Fairies virtual world PixieHollow.com. By simply simpley shaking hands, a girl can connect her offline play with real-world friends and the Pixie Hollow virtual world in amazing new ways for continuous play. Clickables Fairy Collections work together in many different ways to unlock special content for girls in the Pixie Hollow virtual world. They allow girls to make online Fairy friendships and add special virtual clothing, accessories and décor to their Fairies’ online world by simply “clicking” with their real-world friends offline. Girls can also play games offline to earn Tink Points, which can be redeemed for butterfly friends that fly with their Disney Fairy in the online world. 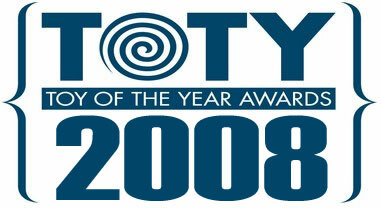 The toys and technology were nominated for a TOTY Award in 2008. Clickables™ Fairy Friendship Bracelet brings girls and Disney Fairies together with the mere touch of a bracelet. A girl can select her Fairy avatar, a special message and a gift, and then save it onto her Clickables Fairy Friendship Bracelet to share offline with friends. When a girl touches her bracelet to her friend’s, her band will glow to confirm that a Fairy Friendship has been made – no cords, no computer, just a touch of pixie dust! Just like the girls, their online Fairies can be friends too. The next time they connect their bracelets to the computer using the enclosed USB cord, they will be able to confirm their friendship and easily find each other in the Disney Fairies Pixie Hollow virtual world (PixieHollow.com). Girls can also unlock Clickables Fairy Charms by touching a charm to the Clickables Fairy Friendship Bracelet or share Tink Points by touching the Clickables Fairy Game to the Clickables Fairy Friendship Bracelet. Clickables™ Fairy Charms Starter Set includes a magical jewelry box, a charm necklace and three special charms powered by Clickables technology. When a girl touches a charm to the Clickables center of her jewelry box, pixie dust sparkles and music plays as the jewelry box comes alive. Each charm unlocks a unique Fairy gift in the Disney Fairies Pixie Hollow virtual world (PixieHollow.com), including special clothing, accessories and décor. 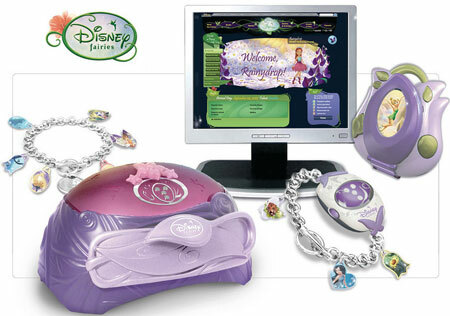 Then they simply connect the Clickables Jewelry box to the computer using the enclosed USB cord to transfer stored charms or Tink Points to their online Fairy world. Clickables jewelry can also be stored in this working box where it will be protected by the magic of Disney Fairies. Clickables™ Fairy Game is a handheld electronic LCD game with five action-packed games. Girls can play as their favorite Disney Fairies characters Tinker Bell, Fawn, Iridessa, Silvermist or Rosetta any time, anywhere. Points earned during the offline games are turned into special Tink Points online. Girls can redeem Tink Points for special butterfly friends that fly with their Fairy online in Pixie Hollow. Girls can also print out and display their individual Disney Fairy in the portrait cover of the LCD as often as they change her appearance using the “Print Fairy Picture” feature. Clickables™ Fairy Charm Bracelet features a customizable charm bracelet and three themed charms for girls to create their own Fairy style. Powered by Clickables technology, each charm unlocks a new, special item in the Disney Fairies Pixie Hollow virtual world (PixieHollow.com). Girls can share these items with each other by simply touching a charm to a friend’s Click ables Fairy Jewelry Box or Clickables Fairy Friendship Bracelet. Then both girls can have the charm’s gift in Pixie Hollow and receive special online rewards by collecting them all. Ages 7+; Suggested retail price: $9.99; Available October 1, 2008. Clickables™ Fairy Charms are also sold separately in accessory packs. Each pack contains three charms themed around a Disney Fairy character. To unlock special clothing, accessories or décor online in Disney Fairies Pixie Hollow virtual world (PixieHollow.com), girls touch the charm to the Clickables Fairy Jewelry Box or Clickables Fairy Friendship Bracelet. When a girl purchases or collects from friends all 31 Clickables Fairy Charms, her Fairy will receive a special reward online.